Sitelinks are shortcuts to important information on your website. They allow users to go directly to the page of the website they're interested in. 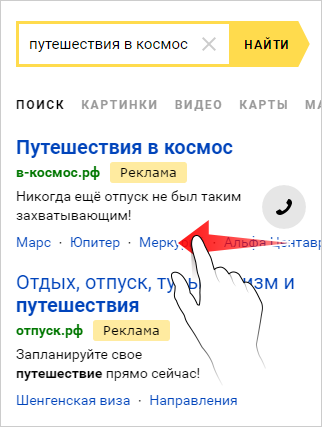 You can add up to four sitelinks to Yandex.Direct ads. These links lead to pages of the advertised site, product or service pages on Yandex.Market or social networks, or Turbo pages. 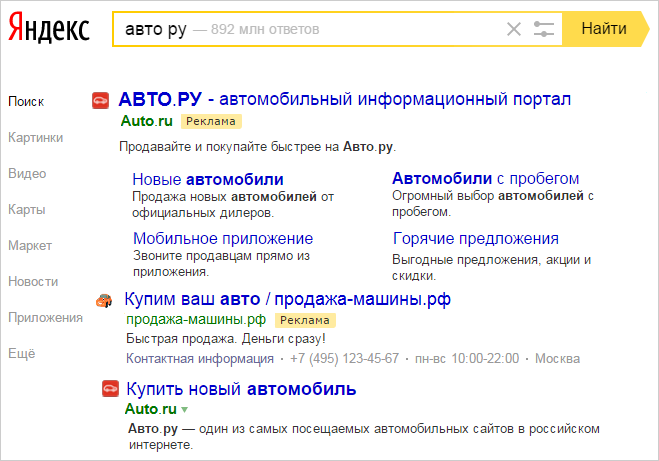 Sitelinks are displayed both on Yandex search results pages and in the ad networks (YAN and ad exchanges). The number of sitelinks that display may vary based on the website and device. 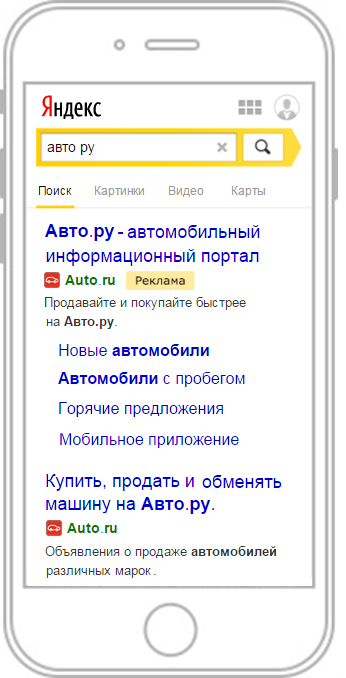 Based on Yandex data, ads with sitelinks attract more visitors. At the same time, sitelinks do not require extra advertising expenses – a sitelink click-through is paid in the same way as clicking on an ad. If a user clicks on more than one link in your ad, you will only pay for one click. With sitelinks, your ad has additional elements that help users go directly to the sections of your website that they are interested in. Sitelinks give you more space to talk about your offers, describe favorable delivery terms, or add other information if there is not enough space for it in the main ad text. You can add sitelinks when you're creating or editing an ad. Just go to the ad editing page and select Sitelinks → Add in the Ad extensions section. You can also add descriptions to sitelinks. To do this, click show. Descriptions help you specify where the sitelink leads. Please note that the sitelink description only displays in expanded format ads on a desktop or tablet. The sitelink text and description must consist of letters, numbers, and symbols (other than “!” and “+”). 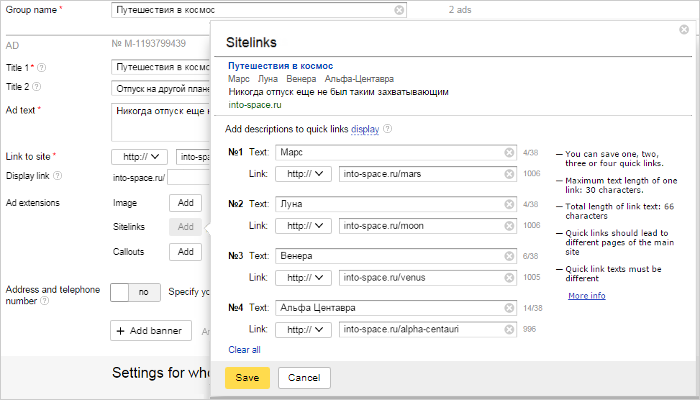 You can add sitelinks to multiple ads simultaneously with XLS/XLSX files, mass changes in multi-editing, Direct Commader or via the Yandex.Direct API. Sitelinks must meet moderation requirements. If sitelinks do not meet the requirements, the ad will be displayed without them. We recommend adding sitelinks that lead to different pages of your site. If the website contains only one page, the sitelinks can lead to different parts of that page. Sitelinks are also displayed on mobile sites. If sitelink texts do not fit in the line, a horizontal scroll bar will appear. An ad may be served in an expanded format on all devices. At least one sitelink was added to your ad. We recommend adding 4 sitelinks with descriptions in order to improve your ad performance. In some cases, the same query may or may not be a navigation query. Automatic algorithms determine whether a query is navigational based on many factors (display region, time, etc.). For example, let's say that there is only one company called “Awesome Irons” in Kursk, but in Moscow there are three. So, for users in Kursk, the query awesome irons company will be navigational, but for users in Moscow it will not be. your bid and ad quality are sufficient enough to be served in the expanded format. the display region is Russia. We recommend thinking of your customers needs first and foremost when using sitelinks.